Feb 7 - “Jesus and the Holy Innocents” © artwork by Br. Mickey McGrath, OSFS. 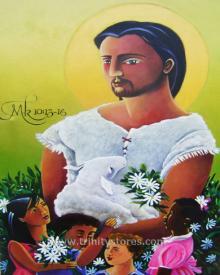 Jesus is represented as a youthful Good Shepherd of biracial (Latino and Vietnamese) descent, surrounded by the children of Bethlehem martyred by Herod's soldiers in an attempt to eliminate the "new King" he had been told about. They are surrounded by the daisy flower which is the Christian symbol of innocence.